ICICIpurelife.com - ICICI has just announced new Online Term Insurance Plan "iProtect Smart". It is one of the comprehensive Best Online Term Insurance Plan which has covered Maximum Term (40 years), female organ cancers, Single, Yearly, Half-Yearly, or Monthly of Premium payment, Tax Benefit and accidental death benefit with critical illness covered. iProtect Smart also provides facility of special premium rates for women,non-tobacco customer. You can get Sum Assured in case of Accidental death. Eligibility Criteria :- Minimum age18-65 year for entry and minimum age for maturity is 23-75 years. There are 3 benefit options Life, Life plus, Life and Health and All in one. which provide different options for entry and maturity age benefit. 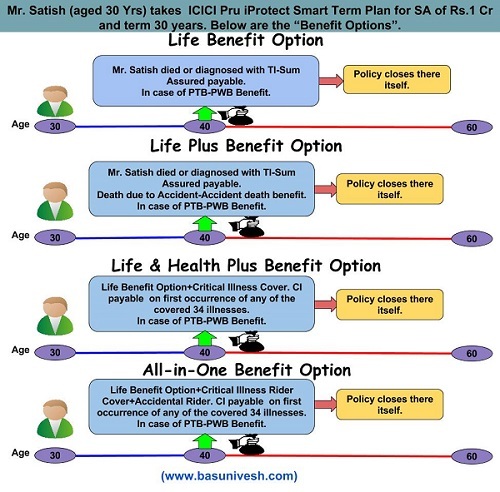 On below image, Basunivesh has perfectly explained the benefit options of iProtect Smart. Take a look at the image, it will help you to understand the benefit option. This are 3 benefit options and all 3 benefit option have different death benefit payout options. Check out benefit option wise death benefit payout options. In below example, assume Person's age 30 years, term 30 years, sum assured Rs.1cr, accidental rider- Rs.1cr, critical illness rider Rs.10 lakh. you get Income benefit of 10%. 10 income to be paid for 10 years to nominee.And the amount will be increased for every year by 10% of simple interest. It means if you buy Term insurance plan of Rs.1.5 crore, you need to pay 17 thousand of yearly premium. In case of your death, your family will receive Rs.1,25,000 for 10 years. In another case if you have bought 1cr of iProtect Smart insurance, you need to pay Rs.15k of annual premium, in case you are diagnosed with critical illness, and you need some money, you will get you money and your term insurance will continue. Upon your death, your nominee will get sum assured minus money given for critical illness. This table is made by Sanyam Jain from simpleinterest.in, In which you can find comparison of ICICI Pru iProtect Smart with HDFC life click 2 protect plus, LIC e-Term Plan, Max Life Online Term Plan, and Kotak life preferred e-term. Hope now its clear for you that which online term insurance plan is good for you. You can ask us any comment you have. Official brochure of ICICI Pru iProtect Smart.